Sold by Youngmer and Fulfilled by Amazon. Gift-wrap available. 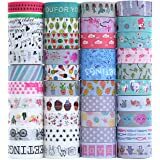 Amazon's Choice for "wasabi tape"
GREAT VALUE SET - Featuring beautiful floral patterns and whimsical animal designs, this pack of 24 washi tapes will add beauty to all your craft projects! 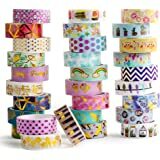 The tape is easy to peel and cut and leaves no sticky residue on surfaces when removed. 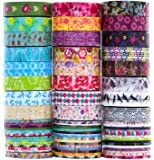 COMPLEMENTARY COLORS - This pack of washi masking tape for crafting comes in a rainbow of gorgeous shades. Pinks and pastels, mint green and lilac; the colors are so lovely! Give a plain lampshade, planter, or trinket box a new lease of life. Recreate the latest wall coverings trend with strips of patterned washi tape. ENJOY YOUR CREATIVE CRAFTS - Jazz up your journal cover then add washi tape tabs to mark important pages. 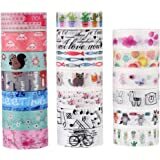 Cover your laptop with a unique washi tape design, then label all those tangled cords behind your desk. 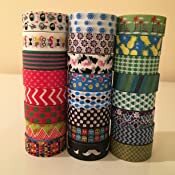 GREAT FOR KIDS - Let the kids go crazy with the animal print washi tape, stamping their personality on their playroom walls!Make mini flags for cupcakes, or decorate mason jar tea light holders for a magical look. 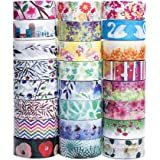 We 100% guarantee the whole family will enjoy demonstrating their artsy talents with this washi tape set. Sold by Youngmer and ships from Amazon Fulfillment. Sold by Zoey Supplies and ships from Amazon Fulfillment. 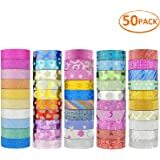 There's a design for everyone in this 24 pack of washi tape! 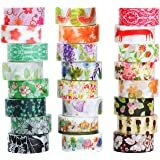 Flowers, fruits, fall leaves...the charming patterns will look so sweet on gift wrap, vases, garlands, or notebooks. Kids will love the simple star print and funky animal designs - let them decorate their toy chests, playhouses, and bookshelves. 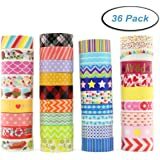 Little boys will love to mark out washi tape car tracks on wooden floors; little girls can make pretty personalized cards for mom using floral print washi tape. If you're a follower of interiors and crafting bloggers, you'll be desperate to try the latest design hack - washi tape furniture! 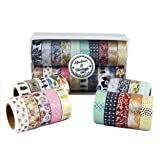 Use this washi masking tape for crafting one-of-a-kind bunting for your vintage-themed bedroom, or for embellishing coffee tables with fancy patterns. 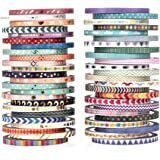 This washi tape set offers exceptional value and a world of creative possibility - so what are you waiting for? Two stars because the designs are really cute, but that’s all. Tape is see throughish, very thin. Tape does not stick well. 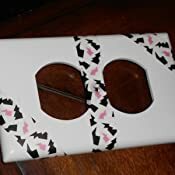 We got it to decorate paper bag book covers and had to keep smoothing tape on there. Thankfully it was not too expensive. 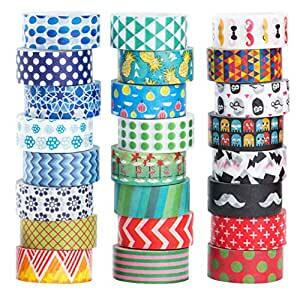 I am really loving these Washi tapes. The little guys with beards are so adorable and I am putting tape onto various things including mail and notes to friends. It gives things a more personal touch and keeps envelopes closed which is really nice. These feel high quality and I like them a lot. Super fun but didn't work for what I wanted. I wish they were alot stickier. 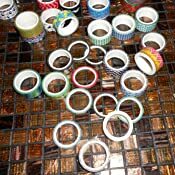 Wouldn't call this "masking" tape, more like scotch tape with designs. However, I wanted it for a children's project. They loved it, so the only reason I didn't put 5 stars is that it's not masking tape. 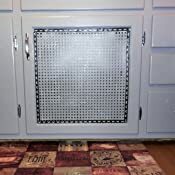 This was purchased for arts and crafts and does the job well. Easy enough for a child to use. 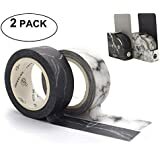 Lots of tape for a good price. I’m a teacher so they’re great for decorating my boards and such. I also let my students use for projects. They go a long way. I bought this tape to wrap on pencils in my classroom and the tape just isn’t sticky enough. Cute designs though. Wouldn’t buy again.